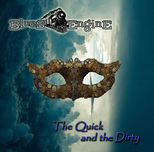 The Quick and The Dirty has the engine steamed up with the blues and is driven along by a generous helping of funk, soul and musicality. Blues Engine work together in harmony building on the talents of guitarist Alex Cooray play that is supported by a rhythm section that hits the groove spot thanks to bassist Alex Liutai and drummer Ovais Hai. Adding to the sweet mix is the deep down bluesy vocals from Katya Chernyakova who adds some mean piano licks to uplift the tracks with an additional tone and texture. Opening with Runaway Blues; this is no stereotypical blues track about trains the beat is fresh and contemporary while firmly grounded in electric blues with rootsy overtones. The guitar intro is stripped back and melodic on For A Breath I Tarry as the piano joins the party the tempo is given a feeling of determination as the rhythm section joins the party, as you wonder if this is an instrumental Katya’s vocals cuts across the music with words that meld into the mix with their simplicity of form and style. The lead-in is a simply guitar and the driving beat of the drum and the vocals curl above them with an upbeat almost a dance tempo because there is The Devil Is Dancing on the Roof; this starts a trio of tracks that ground and shape the album; Long Gone has a lyrical feel it is the words that have the stage and every instrument plays second line to Katya; there is a feel of something emotionally immense about this slightly broody and heavier track. Then the lightness of this optimistic almost bubbly track the light after the Long Gone; This Little Heart makes you smile and want to clap along. As the album draws to a close there is a country, western feel to Alex’s guitar on Hold On and then it is the closing track Valentine; back to the blues done Blues Engine style. The Quick and the Dirty is a debut album that sets the mark high for this young band; with a deep understanding of the blues and a quirky, modern twist added to the mix. Blues Engine are one to watch as their style develops and matures.